Our favorite con of the year is just around the corner. Appleseed Comic Con (formerly the Summit City Comic Con) is next Saturday, May 11, in our hometown stomping grounds of Fort Wayne, Indiana. Folks, we can’t talk this show up enough. It’s totally creator-focused, very family-friendly, and pulls in a great crowd every year. 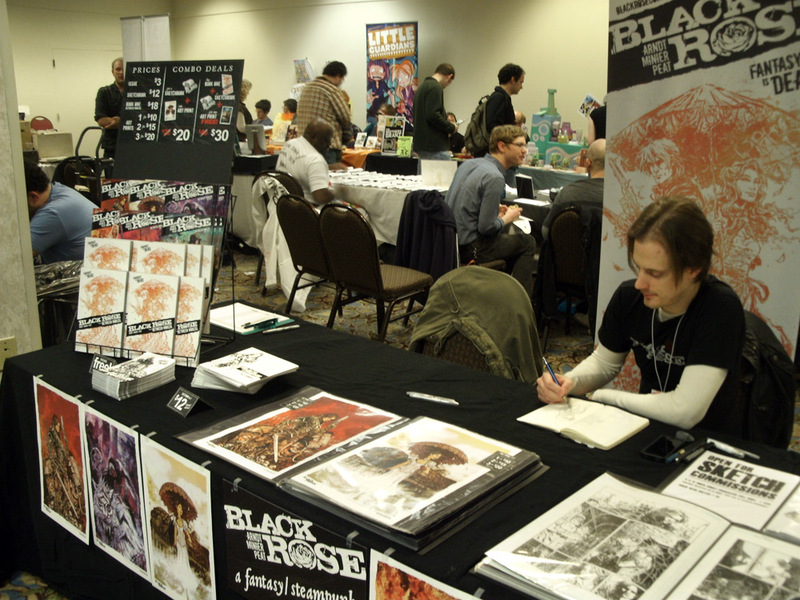 The con’s organizer, the most excellent Zack Kruse, gives creators their tables for free, which is not only magnanimous but practically unheard of. We would normally pay $50-100 for a show with this much foot traffic! But Zack’s whole focus is finding the best comic creators, bringing them to the show, and setting them up like royalty. He’s a class act. You can read a preview article about the show here, or click here to visit the show’s site and get the details. We can’t wait and hope to see you there with our usual assortment of goodies and con-only specials that you won’t want to miss! Also, a big thanks to everybody who came out and saw us at SPACE a couple weeks back. It was a great show — we met a lot of new fans and had a few returning from last year. Schedules permitting, we should be back next year too! We’re now moving into Issue 2, where you’ll start to get a taste of the wider Black Rose world. Thanks for reading and we hope you enjoy!